Learning Dark Arts: April, 2011. I hope everyone had a safe and happy Easter this weekend. I have no discussion for you today. I do want to tell you that I have something special planned in May. Watch this space for it. Thanks, and stay frosty. Music: Sticky Sweet by Motley Crue. It is a frequent movie-making trick to remove the wall of a set to get the desired angle, but I would like to do less of it. It would be my preference to have the camera act as the eyes of some unseen figure--sometimes I'd like to work as if it were actually some character's view of the room, complete with their hands and part of their body in frame--that is a topic for another time. I want to work with a virtual space and give that feeling of being inside of it. I want a more intimate, immediate view of any given scene. When a scene has everything compressed, and stairs are at a wall in an unnatural way, whether or not my camera is in a person's natural space in the room or not, I want to do something about it, and that takes time, effort and often working around a bad kludge in pre and postproduction. Then there is the flip side of this. I mentioned last time about the narrow rooms that are a part of the West Park set. These super-narrow rooms appear correctly from most if not all views allowed through the doors closing them off. If the perspective of the maps is correct, they may even appear correct with the doors open, though that might not be possible to pull off since such a false perception requires knowing the viewing angle, and that would change everything. Putting items into these rooms may be another issue since they will push through walls, and be limited in their rotation. The best way to handle this is the same as they do in forced perspective photography or movies. The easiest is to make the objects smaller along one or more axes--I had to look that up, axes is the plural or axis. The angle at which items sit can also be altered to add to the effect. Music: Rainbow by Aya Hisakawa. Tags: angles, cameras, figures, perception, perspective, postproduction, preproduction, reality, rotation, West Park. When I looked at and ultimately decided to buy the Lobby for the West Park location I was taken in by the first sample image on the sales page. It shows the stairs, two and a bit windows on the landing of the stairs, and the ground level door at the end of the room. I do not know as yet how they managed to create this scene. I cannot do it with any camera angle. I can begin to approach it slightly by lowering the X scale of the set and removing some walls from sight, but that still leaves pieces missing and only sort of captures the stairs and windows, not the door. It matches some of the lack of depth, but I don't think all of it. It was the fact that the stairs are quite shallow in the render that made me try the X scale. I think the answer is more likely to be something done to the camera, which I have hardly played around with yet. Until you look at it closely the render gives the perception that this is what the space looks like, and aside from the stairs it looks like a good perspective. The floor looks a little off as well, but until you are looking at in DazStudio you cannot tell that difference is not inherent to the floor's map. One of the false perceptions that I have noticed in many Daz3D locations--I don't have Poser to compare if those versions are identical in this matter--is that perception trumps reality. You get in there with the camera and swing it around and find many things are narrower than you expect. It is sometimes hard to use the camera as if it were a real object within the scene or it was the eyes of a person. I end up staring at walls and have to turn their visibility off. Back to the camera, I wonder what can be done without affect the other aspects of my final image. Just for note, I do still suggest this set, and the other West Park sets and their Overlook counterparts. Music: Love Don't Lie by Def Leppard. 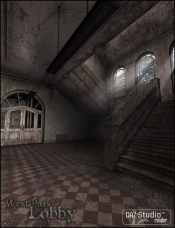 Tags: angles, cameras, Daz3D, depth (visual), perception, perspective, reality, scale, West Park Lobby (Daz).